If the stock market suddenly plunges, how long can I expect to wait before I can get back to these highs? Is my portfolio balanced correctly? 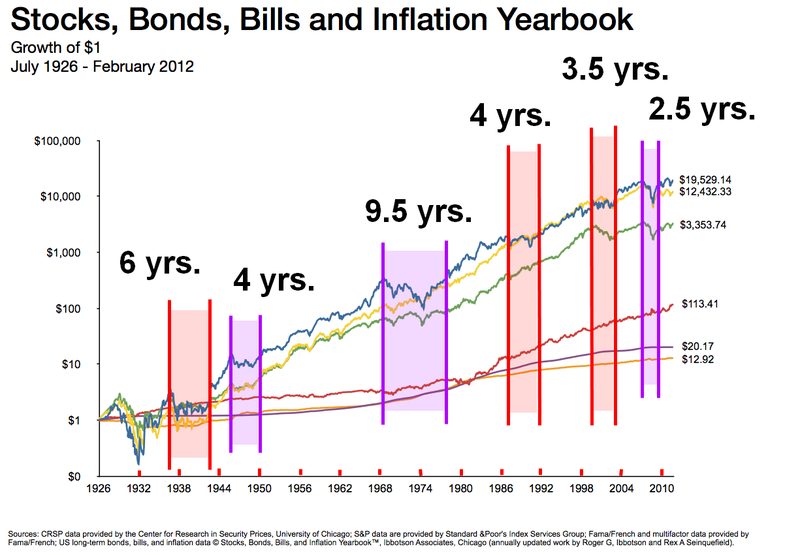 The first question requires us to look at the stock market’s history before we can even begin to guess on a time frame. As you can see from the chart below, if the stock market suddenly drops, we could wait as long as 9.5 years (until 2020) to return to the same levels, just as was the case between 1968 to 1977. This, however, was the absolute worst case scenario over 80 years of history in the stock market! It’s not out of the question that something like this could happen again, but I think we should more realistically, at least based on modern-day history with the invention of computers and e-commerce, expect to wait 2.5 to 4 years (see years 1986-2012 in the chart below). I always like to add an extra buffer, so my final answer would be 5-6 years to rebound from a market crash. If you cannot, or do not want to, wait 5-6 years to get back to where you are now, then it’s important to evaluate your positions. And this brings us to the second question: Is my portfolio balanced correctly? It’s really critical to evaluate your entire stock portfolio while the market is hitting new highs. If you find that you own stocks that you can’t see yourself owning, or you think you may not want to own in 5-6 years, then now is a good time to consider reducing or eliminating those positions. Especially if you’ve already, at least collectively, made a profit off of them. Just make sure your portfolio remains diversified. Portfolio allocations should be balanced across the 7 industry sectors; Basic materials, Consumer goods, Financial, Healthcare, Services, Technology and Utilities. If you are only invested in a couple of these industries, try not to favor any particular industry. For example, if you find that the majority of your money is invested between $GOOG (Google), $YHOO (Yahoo! ), $FB (Facebook) and $TWTR (Twitter), you should consider reducing or eliminating some of those positions. Keep in mind that it’s very easy to love your winning stocks while they’re winning. It’s even easier to hate them while they’re losing! With an unbalanced portfolio, it’s very important to keep a close eye on the market. This is your only option. The only problem with this strategy is that it can take too much time and it can also be pretty stressful. Your money could be put on a rocky roller-coaster ride if you are overexposed to any one particular industry sector. To avoid this, you will want to re-balance your portfolio.